Makerspace is a catch all term to refer to a service that offers equipment that enables the creation or fabrication of prototypes of designs or customized “parts.” The vision for the Walker Library Makerspace service is to provide an active-learning experience for students to use technology as a tool and to make it accessible to students of every level of technical expertise. Research libraries with a makerspace learning area have found them to be instrumental in support of the STEAM (science, technology, engineering, arts, and math) initiatives. The Makerspace, located on the 2nd floor of the James E. Walker Library, offers knowledgeable staff who provide direction to appropriate resources and train users on the use of media applications and equipment. We offer unique facilities to enable the exploration for learning experiences, collaboration, and creative expression. 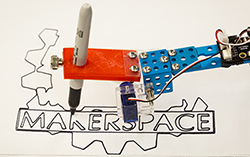 The Makerspace is a welcoming space for users of all abilities, disciplines, levels and interests. Who may use the Makerspace? MTSU faculty, staff, and students who have been trained on the equipment. All equipment must be used in the Makerspace. At this time there is no charge to use the equipment, but users are required to bring their own supplies for equipment such as the vinyl cutter. More information will be forthcoming on policies, procedures, costs, and material sources. See software in the library.